The temperament of the Lagotto Romagnolo: His strength or his weakness? The Lagotto Romagnolo is a dog that is slowly becoming popular. The breed is getting to know and appreciate all over the world. It’s a medium dog, curly coat and hypoallergenic, a clever and polite dog that adores people and childs. His adorable and affectionate character make him suitable as a companion dog in every habitat. For us that we live and breed with the Lagotti , it is not all so obvious. We know well every litter is a story to itself. Sometimes puppies are bravehearts. Other times they start out more slowly. Our goal is still the same: puppies serene and in confidence. The natural shyness or rather the confidentiality typical of the Lagotto Romagnolo should never result in fear for new situations. 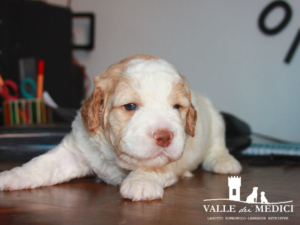 Here is what we consider essential to fortify the character of the our puppies of Lagotto Romagnolo. Our kennel is our home. The house where we shake a little and where we breed our puppies. Although we do not miss the space outside, we are convinced that the puppies must be born in the house. The mother doesn\’t feel lonely and is constantly followed even at night. Even before the puppies start to feel and see us we are there to handle them and do exercises that help him in the development. It\’s important that mom be serene when she grows her litter. For this reason the future mother always spends the last period of gestation at home with us. The teachings and tranquility that can give mom, can not give them anyone else! Puppies accustomed to seeing people and receiving cuddles helps him not to live with fear the presence of man. Inside the litter we often notice a slightly scariest little puppy. It\’s a small room! Leaving him in an abandoned box to his fears would be devastating to him. Our puppies that go to the city can live with some anxiety the first experiences with the noise of city traffic, but also that is soon exceeded. Certainly when they see people and children know how to get pampered. The moment comes that the litter leaves the house and accesses the garden. With the mum always close the puppies have the way to know new spaces and other dogs. Positive experiences that you bring back. Knowing other dogs or other animals will certainly be useful in the near future. The game is the best way to educate and familiarize yourself with the puppies. The game to gain the trust of the litter. Every day we dedicate some time to play with the litter. Exploiting the innate sense of truffle we use scented games. That’s why some of our lagotto make unexpected discoveries in unsuspected places.